Client side script code means that it can be VB Script or J# script or Java script. Client side script is embedded in .aspx pages, .html files or inside .js files. Generally, client side script is loaded by client application like Internet Explorer running on your local machine. 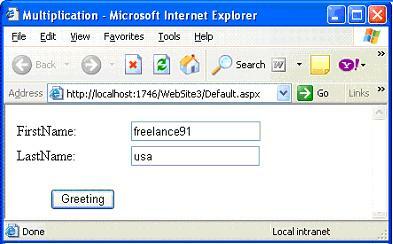 Enable client side script debugging in Internet Explorer. 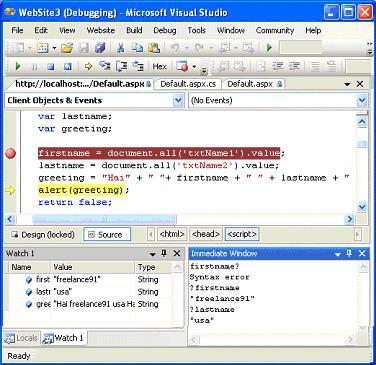 You can now debug client side script code directly in Visual Studio 2005 environment. It is made possible through powerful debugging options that enable you to debug managed code, script code, T-SQL code, and native code. 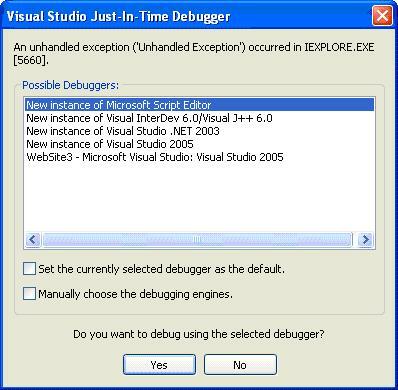 Visual studio 2005 supports 64-bit debugging either locally or remotely. visualizers which allow us to view contents of complex variables and data types in a meaningful way. 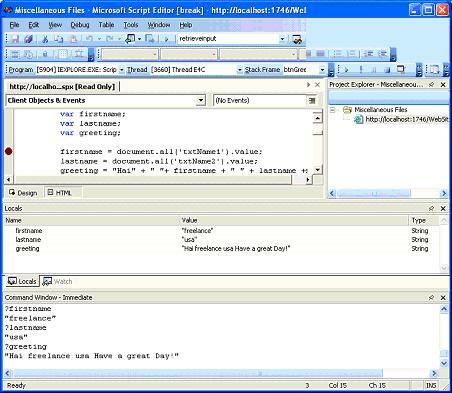 example Visual Studio 2005 project. Press F5 (Start Debugging) to start debugging. 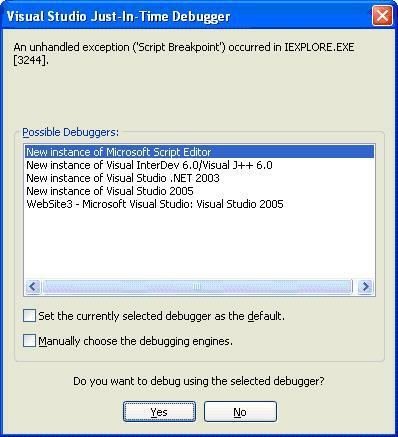 IEXPLORE.EXE process is attached automatically to debugger. 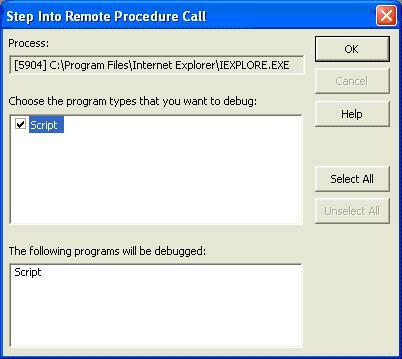 We are using IE to load the scripts so IEXPLORE.EXE is attached. 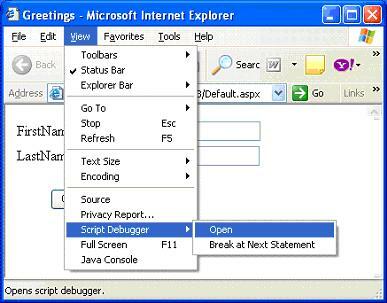 You should always include keyword "debugger" as the first line of Java script code you wish to debug in Visual studio 2005. This keyword automatically invokes Visual Studio client side debugger. Again return back to IE. Give the values for the first name and last name and click greeting button. You can see control returning to Script Explorer as shown in below listing. Use F10 to step over each line of code. Similarly, use F11 to step into each line of code. In script explorer, you can set new breakpoints and use Locals Window to inspect values of local variables in the script. Immediate Window evaluates the values of variables. See the Data tips by hovering over the variables. You can also use Command Window to execute commands against script code variables like Debug.print command. To invoke Command Window click->View->Other Windows->Command Window. 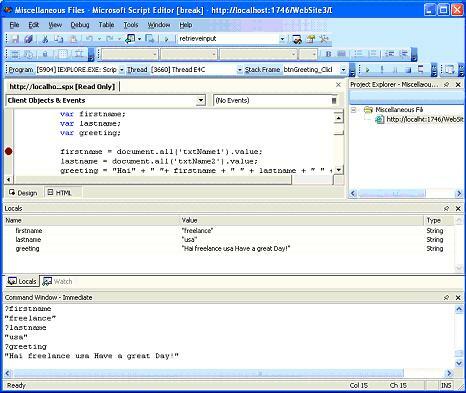 Microsoft Script Editor (MSE) is powerful tool which debugs Java scripts using Internet Explorer as script host. It is shipped as free component in Office XP and Office 2003. This is an attractive option when all that you need is to debug Java scripts for IE and you don't have Visual studio .Net installed on your machine. 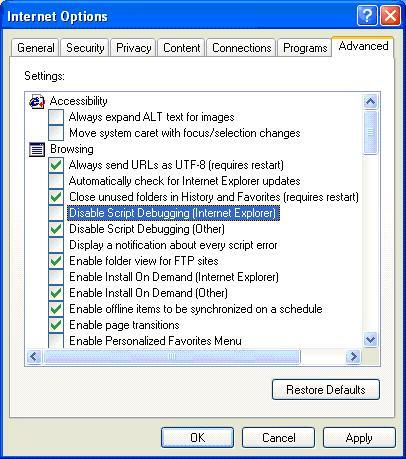 You can check for MSE in your machine by clicking View option on IE and see if you can find script debugger option. and similar others features like Locals Window and Command Window. You can use same F10 to step over code. says "An unhandled exception 'Script Breakpoint' occurred" in script. When you are done debugging make sure the browser is not waiting for debugger. Simply press F5 to continue or else explicitly close the debugger. Click "Yes" when it prompts to close debugger. This way you can save from computer hang up. (It happened to me!!) When using MSE. 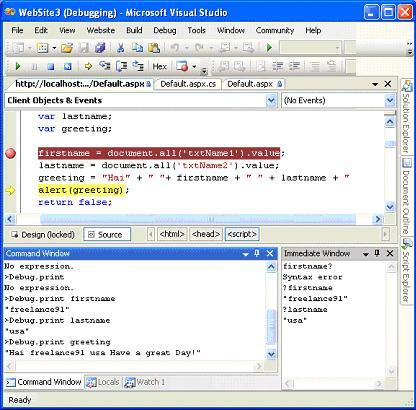 Visual Studio 2005 Integrated debugger is very powerful and rich in features. You can now debug client side script code with the same flexibility as you used to have with debugging server side code. You can say good bye to clumsy alert statement technique employed in Java script debugging. Microsoft Script Editor is another attractive option for debugging with no fewer features compared to Visual studio 2005 debugger.